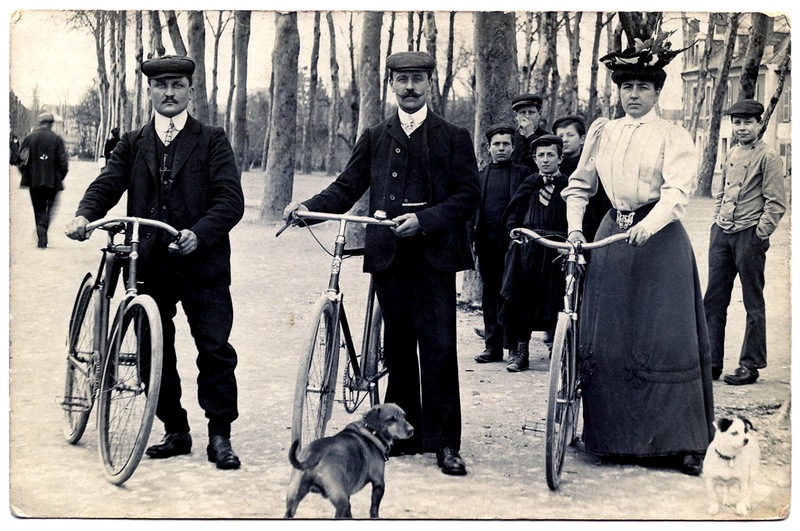 This is a wonderful Antique Photo Postcard showing 3 people with their Bicycles. Shown are 2 Victorian Men and a Woman, as well as 2 cute Dogs! I wish I new more about this card. What do you think …are they about to race?! 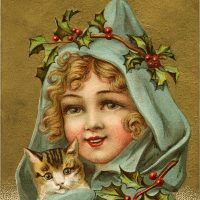 Old Photo – Glamour Girl – Beauty Old Cute Girl and Cat Christmas Image! Nostalgic Elf in Christmas Stocking Image! I’m not an expert, but I believe this could be Edwardian rather than Victorian. Maybe…certainly late Victorian. Those leg o’ mutton sleeves were fashionable in the 1890’s. Yes, the sleeves are a giveaway. Edwardian era sleeves were flat and tighter in the upper arm, like today. The lady in question could have been wearing outdated clothing! That is definitely snow on the ground yet no one looks uncomfortably cold…….. I can see this being a lot of fun – thank you! I love the photo! I don’t think a woman would race, not officially in that age. Maybe a very adventurous woman would race out in the countryside where there was no audience! I think they are going on a Sunday afternoon outing, sedate and with dignity! No one is wearing overcoats, but it looks as if there is snow everywhere. What brave souls to bicycle in that! Also, could this be a European location? I think the boy on the far right is wearing clogs. I also thought it was snow on ground but think due to age of image the ground is just faded alot. Love her hat. Thanks Karen, you are a jewel. I love that you all are adding your two cents on this one! I didn’t scan the back of the card, because there is no handwriting or stamp, and it’s not very interesting to look at, but the text is in French, so it is a European card just as Rebecca guessed! I wonder if you can use google translator to decipher what the text is about?? After seeing this picture first image that came to my mind is Charli Chaplin movies. Great picture. 1 – Did anyone else notice the boy picking his nose? That cracked me up. 2 – I’m so curious about what the dogs are looking at. A 1890s squirrel? Nah, they’d be a blurred action shot. It looks like they are both looking at the same thing. AH – I got it! Someone is eating and they are perched to jump on any dropped morsels! 3 – I love the candid nature of the photo. Candids are hard to come by from this era.